[Update below: Now with even more Treason!] SoOo... Trump & Putin's presser - quite the dust-up over it, eh? Hey... did you actually listen to the entire thing? Or just the reports of it? Huh. Well I hadn't seen or heard any of the press conference during the day, and I was at practice for the evening, but when I turned on the radio on my way home, I caught some of NPR's 'special coverage' of their summit, and I can't describe their attitude, comments, tonality, as anything other than comically over the top, even chortling with glee over Trump's comments which they more than hinted at being utterly inept, disgraceful and seemingly approaching 'treasonous', that I couldn't take them seriously, at least not without actually hearing the press conference. "This was clearly not [President Trump's] best performance. He's done a whole lot better than this. He should have defended us. He should have defended his own intelligence community." , and it went downhill from there. Again, lots of exuberant commentary, but... not much substance. It was getting late, and I really wasn't in the mood, but... this seemed like something I'd better bother with, so I pulled up the full uncut video, from CNN, and the transcript from NPR, and watched. WTH? I was promised weakness, ineptitude, 'treasonous statements! ', and all of that was supposed to come out of this? Seriously? Worst of all, late as it is, here I'm at it, once again, having to stick up for someone that I've dislike since the 1980's, someone I'd much rather had lost the primaries in 2016, but... this spiel is not only wrong, but these wrongs are consequential to our lives, and so... here I go again, seeing to it that the wrongs are addressed. Sheesh. From his prepared statement, I took issue with one statement, which I'll note below, that I think improperly brought domestic political disputes into an a discussion of international affairs, which was unwise and bad form. But... it wasn't all that. Or, IOW, Trump. Go figure. And the other issue was less a problem with what he said, but that he said it in the midst of a larger comment, that was way too easily one to be taken out of context. He knows better than that. From the earliest days of our republic, American leaders have understood that diplomacy and engagement is preferable to conflict and hostility. "... But our relationship has never been worse than it is now. However, that changed, as of about four hours ago...."
"...As president, I cannot make decisions on foreign policy in a futile effort to appease partisan critics, or the media, or Democrats who want to do nothing but resist and obstruct..."
, that statement should have ended at "or the media", full stop. He never should have brought in issues of domestic politics into his statement at the press conference after an important international discussion. Yes the press was going to, but he should have left that to their own bad form. Bad Trump. "...Constructive dialogue between the United States and Russia afford the opportunity to open new pathways toward peace and stability in our world. 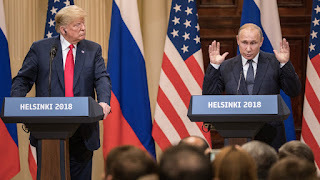 As president, I will always put what is best for America and what is best for the American people...."
"...During today's meeting, I addressed directly with President Putin the issue of Russian interference in our elections. I felt this was a message best delivered in person. I spent a great deal of time talking about it and President Putin may very well want to address it and very strongly, because he feels very strongly about it and he has an interesting idea...."
Given the fact that our own investigations into the alleged issue are still ongoing, and that zero evidence has been presented of actual the dread 'Russian Collusion! ', that was all I, and I think most people needed or cared to see. Repeating: The investigation is still ongoing, there are no charges to be made, until there are charges actually made. "...As we discussed at length, the crisis in Syria is a complex one...."
"...I also made clear that the United States will not allow Iran to benefit from our successful campaign against ISIS. We have just about eradicated ISIS in the area...."
"...This was a very constructive few hours that we spent together. It's in the interest of both of our countries to continue our conversation and we have agreed to do so...."
That was on the whole a solid statement of the situation, and a reasonable expectation for starting towards improving relations. I've no problem with it, other than what I noted. Do you? If so, could you add a comment which references what in particular you have issue with? "And the second question, before the meeting with President Putin, you called him an adversary, a rival, and yet you expressed hope that you will be able to bring this relationship to a new level. Did you manage to do this?" We'll be competing. As you know the United States is now or soon will be, but I think it actually is right now, the largest in the oil and gas world...."
REUTERS: Thank you. Mr. President, you tweeted this morning that it's U.S. foolishness, stupidity, and the Mueller probe that is responsible for the decline in U.S. relations with Russia. Do you hold Russia at all accountable or anything in particular? And if so, what would you what would you consider them that they are responsible for? Not only was that a misstatement and conflation of what Trump said, but it ignored the fact that Trump already stated in his statement, that they had discussed points of deep disagreement over, and which he hoped progress would be made. WTH else did they expect? Did they want Trump to curse Putin out, and maybe shove him off his podium? Did they want Trump to behave as the thug like to fantasize about him being? "where did you get this idea that President Trump trusts me or I trust him?" ",,,We should be guided by facts. Could you name a single fact that definitively prove that collusion? This is utter nonsense.,,,"
"...We can offer the appropriate commission headed by special attorney Mueller. Moreover, we can meet you halfway. We can make another step. We can actually permit official representatives of the United States, including the members of this very commission headed by Mr. Mueller, we can lead them into the country and they will be present for this questioning...."
...we believe have something to do with illegal actions on the territory of Russia. And we have to request the presence of our law enforcement. For instance, we can bring up Mr. Browder in this particular case. Business associates of Mr. Browder have earned over one and a half billion dollars in Russia. They never paid any taxes, neither in Russian army in the United States and yet the money escaped the country, they were transferred to the United States. They sent huge amount of money - 400 million - as a contribution to the campaign of Hillary Clinton. That's kinda a big deal. Even after you de-Pravadize it... that's a big deal. And it's my guess that that is what most of the uproar over this summit has really been about. I've been wondering that. I've been asking that for months and months..."
"...With that being said, all I can do is ask the question. I will say this: I don't see any reason why it would be. But I really do want to see the server but I have, I have confidence in both parties...."
If you're able to view that entire press conference, and come away from it as President Trump saying he's best buds, lackey even, to Putin... well unless you can point to me the comments, in context, from the transcript that backs you up, then I've gotta say, that you have zero credibility in what you are saying. But, hey. I could be wrong. How about you prove it? "Mr. Madison, thought the definition too narrow. It did not appear to go as far as the Stat. of Edwd. III. He did not see why more latitude might not be left to the Legislature. It wd. be as safe as in the hands of State legislatures; and it was inconvenient to bar a discretion which experience might enlighten, and which might be applied to good purposes as well as be abused. Mr Mason was for pursuing the Stat: of Edwd. III. Mr. Govr Morris was for giving to the Union an exclusive right ..."
Hopefully, if you're interested in bandying about charges of 'Treason! ', you'll take the few minutes necessary to give that a look over. Aid and comfort' was defined by Lord Reading in the Casement trial comprehensively, as it should be, and yet probably with as much precision as the nature of the matter will permit: '* * * an act which strengthens or tends to strengthen the enemies of the King in the conduct of a war against the King, that is in law the giving of aid and comfort' and 'an act which weakens or tends to weaken the power of the King and of the country to resist or to attack the enemies of the King and the country * * * is * * * giving of aid and comfort.' Lord Reading explained it, as we think one must, in terms of an 'act.' It is not easy, if indeed possible, to think of a way in which 'aid and comfort' and be 'given' to an enemy except by some kind of action. Its very nature partakes of a deed or physical activity as opposed to a mental operation. Thus the crime of treason consists of two elements: adherence to the enemy; and rendering him aid and comfort. A citizen intellectually or emotionally may favor the enemy and harbor sympathies or convictions disloyal to this country's policy or interest, but so long as he commits no act of aid and comfort to the enemy, there is no treason. On the other hand, a citizen may take actions, which do aid and comfort the enemy—making a speech critical of the government or opposing its measures, profiteering, striking in defense plants or essential work, and the hundred other things which impair our cohesion and diminish our strength but if there is no adherence to the enemy in this, if there is no intent to betray, there is no treason...."
Would someone please tell me why my tax dollars are going to support liberal fascist NPR? Why do we still give money to Planned Parenthood? Shouldn't the taxpayers have some say OTHER than their criminal congresspeople? Unknown said "Would someone please tell me why my tax dollars are going to support liberal fascist NPR? Why do we still give money to Planned Parenthood?" Sure. Our tax dollars go to such purposes, because We The People don't care enough to insist that congress and our courts limit our Govt to the Constitution they were formed from. Why? Because there are other things Govt does, unconstitutionally, that We The People do like. "...Shouldn't the taxpayers have some say OTHER than their criminal congresspeople?" No and Yes. The taxpayers can have no other say than the legislators they elect. The fact that they elect those who are prone to criminality, might be a reflection of their own disregard for the force of law, being limited (as a rule) to the letter of the law. In short, we have the Government we deserve. Govt - power over us - will always sink as low as those under it will permit it to. If we don't like that - and I certainly do not - then it's up to us to understand the concepts that our Constitution was derived from, and to do what we can - however little that might seem to be - to discuss and communicate the importance of that, to those around us. Kathleen Alfaro said "Does giving pallet loads of cash to leading state sponsor of terrorism count as aid and comfort ??? :-/"
I suspect the answer you get to that, will depend upon whose 'greater good' the person you ask, thinks it serves. On the other hand, if we expected our Govt to uphold and defend our individual rights, under the rule of law, through laws derived from our Constitution... we'd never have allowed ourselves to get into the position where such a question would have to be asked.